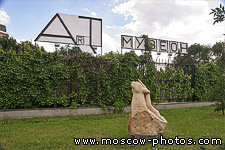 The «Muzeon» Arts park that is located at the Krymsky Val street close to the Central House of Artists, officially started its operation since January 1992. 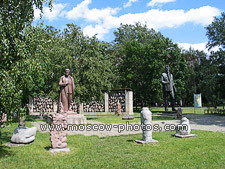 But even before that time, right after the downfall of the Soviet power, they started to bring there the monuments to the overthrown leaders. 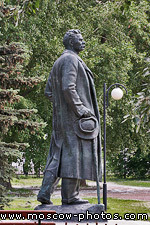 Some of the monuments have been created by famous the world over artists. 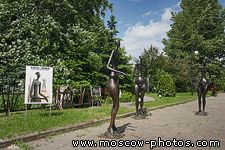 These artworks lie scattered and unattended. Then it occurred to somebody to turn the junkyard into the Arts park. 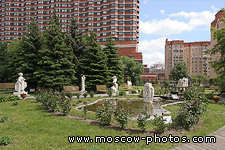 The most impressive part of that outdoor exposition can be considered the monuments that used to stand at main squares of Moscow. 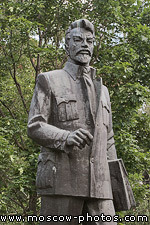 While walking along the Park alleys you suddenly find yourself at the «last place of arms» of the Soviet Union, marked by a powerful silhouette of No.1 security officer F.E. 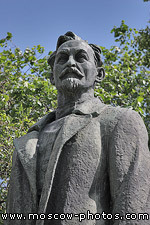 Dzerzhinsky, stocky figure of J.V.Stalin, «Lenin's corner», where busts and full height figures recreate the biography of V.I. 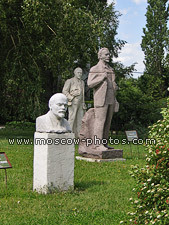 Lenin from his student years to those severe years, when the great Soviet State was created. One cannot help but stand in front of the monument to Ya. 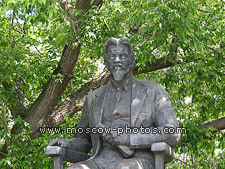 M. Sverdlov, about whose personality historians have written so much bad (just one «vault, stuffed with gold and precious stones» is a host in himself!) that you don't even know, whether to believe these exposures or not. 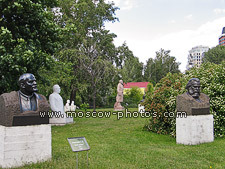 The monument to the «all-Union headman» (Chairman of the Supreme soviet) M.M. 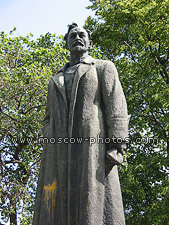 Kalinin is stained with paint. Somebody, «having made up» his eyes, gave him a look of a vampire (monster), waiting for his victim in the shade of the trees. L.I. 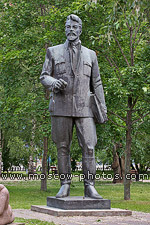 Brezhnev in white marble looks majestically. 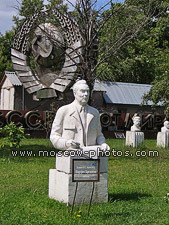 Behind him - there is a state coat of arms of the Soviet Union and a slogan: «USSR is a stronghold of peace!» You immediately start thinking — and the present Russia is a stronghold of what? 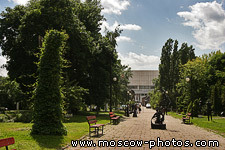 The first that comes into mind — is a «stronghold of oligarchs». 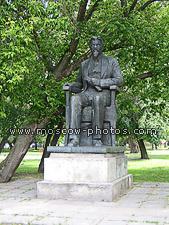 You know, dear Leonid Ilyich, many Russians recollect those times of yours with nostalgia! 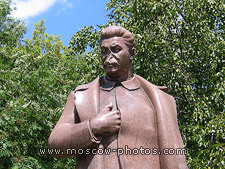 Only one «monument of the Soviet times» seems to be physically damaged — the nose of Josef Stalin has been broken off. Somebody might have failed to restrain his emotions when met him. 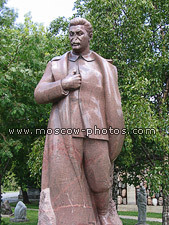 Stalin till now is the source of stress for those in Russia, who without a fight surrender one after another its positions in the modern world. 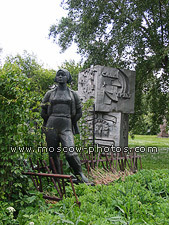 A girl in a working overalls, standing near to decorative metal cubes «Glory to labour», - another sad echo of the past years. 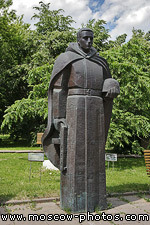 And this sorrowful warrior might be thinking whether sacrifices were vain or not. 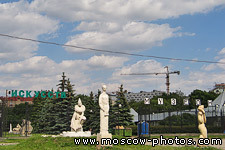 And this feeling of awful defeat dominates over the «last territory of the Soviet epoch».